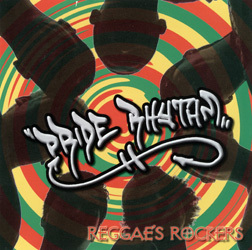 Pride Rhythm steps forward with credentials that are pretty much the same as two dozen other young Jawaiian bands: They've been together for only a couple of years, they're all self-taught musicians and they're making their debut as recording artists with significant reinforcement from a team of experienced studio musicians. It's hard to tell what the septet can do without the hired guns, but this is a strong debut album nonetheless. T.J. Plunkett provides the local touch with his crisp work on ukulele, and guitarist Edson Parubrub distinguishes himself as the group's primary songwriter. Parubrub wrote 10 of the 11 originals, and several of them should be local hits. "Stand Up" makes for a catchy opener. "Fly Away" suggests the group's range within a memorable account of someone "leaving for the nation" (i.e., the mainland). While it owes nothing to "Honolulu City Lights," the song conveys a similar feeling. Parubrub and the guys do their best work with "Smoke Out" as he playfully tweaks political correctness with lyrics such as "the ganja you smoke/makes ya feel like/there is some hope in dope." Add an irresistible rhythm, and "Smoke Out" is a perfect party anthem. Pride Rhythm also shows originality with a bilingual Jawaiian arrangement of "Sukiyaki" that alternates between Rokusuke Ei's original Japanese lyrics (recorded by Kyu Sakamoto in 1961) and the completely unrelated English lyrics recorded by A Taste of Honey in 1979. Including the English translation of Ei's lyrics as well would have made it perfect. Big Island resident Dawn leads a "spiritual ohana" of like-minded musicians and vocalists in writing and recording an album of unpretentious roots reggae. The liner notes proclaim his latest album as "The 1st Sunday Reggae Church CD," and that's an apt description of the contents. 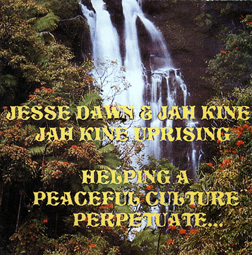 All the songs are originals, and most either praise Jah (God) or express the group's commitment to resisting the evils of the mainstream "downpressor" system. Although their arrangements are minimalist, Dawn and his band move beyond familiar reggae rhythms. Several songs sound like anthropological field recordings or a street group performance. Others have a trancelike, somnambulant vibe reminiscent of classic Jamaican reggae. Dawn's latest home-brewed album isn't commercial in terms of what Hawaii's self-styled "island music" radio stations play, but his lyrics offer an articulate critique on the evils of contemporary America as viewed from a "Jah kine" perspective. As usual with Dawn's work, there's more substance here than the cut-and-paste album art suggests. The impact of the Internet in marketing CDs outside traditional record distribution networks is seen in the success to date of Mendez's CD single. It is currently available for sale only online, has gotten no radio play but nevertheless won "Single of the Year" at the 2006 Hawaii Music Awards this month. It also provides a preview of her upcoming album, "Back to the Islands," Mendez's first in several years, which is scheduled for release sometime this summer. The song is a catchy trifle reminiscent of the whimsical recordings of Don Tiki. Mendez sings of an idealized beachfront luau where "ribs and yams begin to simmer" while the partygoers enjoy tropical beverages and do the titular dance. It's a fanciful place where "wahine" rhymes with "bikini," and an all-star group of musicians (including Steve Jones, Noel Okimoto and Greg Sardinha) provides smooth instrumental support. A second version tells the story in Spanish. This doesn't fit "island music" radio station playlists, but those that have easy-listening formats should give it a listen. For more information go to www.alohajoe.com.